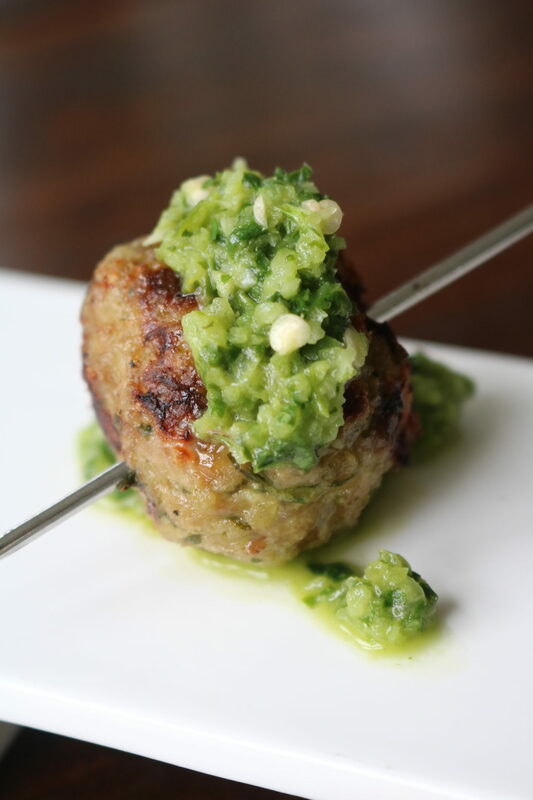 We never need an excuse to make a weeknight meal luxe, and these Grilled Lamb Meatballs with Three Herb Salsa Verde make us feel like we’re dining out! Enjoy three fresh herbs in this delish dish tonight! Add all the salsa verde ingredients to your food processor and pulse until finely minced. Taste for seasoning and refrigerate until ready for use. Preheat your grill to medium-high (375-400 degrees) and oil the grate. Place the ground lamb, egg, and panko in a medium-sized mixing bowl. Add the garlic, onion, parsley, olive oil, salt, black pepper, and half and half to the food and pulse until finely chopped. Pour the mixture over the lamb and knead with your hands until evenly mixed and form into tablespoon-sized balls (approximately). Grill for approximately 5 minutes on each side depending on the size of the meatballs. Salt lightly during the grilling process. Serve immediately with three herb salsa verde. Enjoy!